A graduate of the University of Northern Iowa, David has been involved in the automobile industry for over 40 years. He was vice president /general manager of Covey Lincoln Mercury in Phoenix, Arizona, before coming to Toyota of Orange in 1982. He was general manager there for three years before purchasing the dealership in 1985. Mr. Wilson is now the owner and C.E.O. of seventeen automobile dealerships - employing more than 2000 people. Sales for these corporations total over $2 billion annually, making Wilson Automotive one of the largest dealer groups in the nation. As a gubernatorial appointee, David served on the California New Motor Vehicle Board for 14 years, including 2 years as vice president and 2 years as president. Other Boards on which he has served are numerous local and national automobile associations, and the Southern California Toyota Dealers Advertising Assn. He has also been a member of the Board of Directors for the Orange Chamber of Commerce and was selected Business Person of the Year by them for 1987. He received the Sports Illustrated Dealer of Distinction Award in 1988, and the Time Magazine Quality Dealer Award in 1991 and again in 2004. In 1998 he was presented with the A.I.A.D.A. All-Star Dealer Award for his commitment to the community and work with charitable organizations. A panel of community leaders named David one of 10 “Local Heroes” in 1998. In June 2000 he was awarded the prestigious Passkey Award for Business Ethics by the Ralph W. Leatherby Center for Entrepreneurship and Business Ethics. Also in 2000 he received the Boy Scouts’ “Good Scout Award” for exceptional community service. In 2001 Chapman University honored him as Orange County’s Outstanding Corporate Citizen at their annual American Celebration. He was also named the YMCA Orange County Executive of the Year in 2005. In 2007 he received the Excellence in Entrepreneurship Award from the Orange County Business Journal, as well as the General William Lyon Crystal Vision Philanthropy Award. 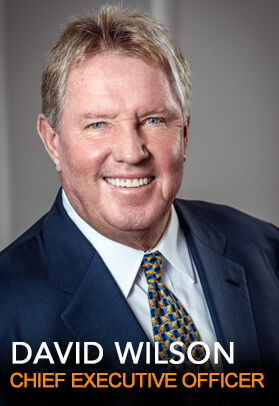 The American International Auto Dealers Association presented David with its “Lifetime Achievement Award” in 2014 for his deep commitment to the auto industry and community involvement. Most recently, at the Athletes First Classic Gala in 2017 he and his wife Holly received The Golden Heart Award for their leadership in doing good and benefiting humanity. David and Toyota of Orange were the originators/sponsors of the 'Round Orange Race, a 10K/5K run with nearly 4,000 participants annually that raised over $250,000 for Orangewood Children's Foundation. That race then became a signature homecoming event at Chapman University, the Chapman University/Toyota of Orange ‘Round Orange Race, that raised scholarship funds for worthy Chapman students. Mr. Wilson is a member of the prestigious Chapman University Board of Trustees. He served on the Board of Directors of the Orange County Council of the Boy Scouts of America, and was the Chairman of their annual golf tournament, which raised nearly $200,000 annually for Scouting. He also served nearly 20 years on the Board of Directors of Orangewood Children's Foundation and was the honoree for their Orange Blossom Ball, which raised over $300,000 for the foundation. In appreciation for David’s generosity to his employees and the community, the David Wilson Endowment Fund was established by his employees and friends to benefit Orangewood. This fund now contains over $1,000,000 and enables worthy former residents of the Children's Home to obtain a post-secondary education they would not otherwise be able to afford. More than 50 Orangewood alumnae have attended college and trade or technical schools as a result of this endowment. In 1999 David contributed $1,000,000 to his alma mater, the University of Northern Iowa, to endow a Chair in Business Ethics. If you visit Chapman University in Orange, you will see Wilson Field, made possible by David & Holly’s generous $3,000,000 donation. David and his family live in Orange County, California.